THE latest Economic Survey (1991-92) presents a very interesting set of statistics. 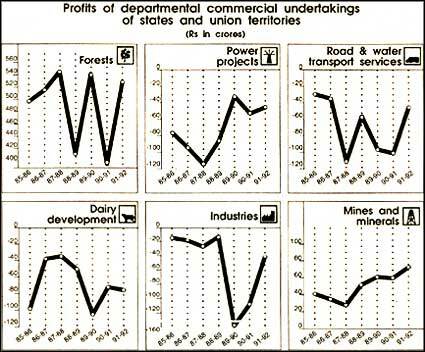 It shows that, out of all types of commercial undertakings of state departments, only those based on forests and mining have maintained a steady profit margin between 1985 and 1992, while all the others -- industrial firms, dairies, irrigation and power projects -- have suffered losses. This is when many minerals and forest resources are sold cheaply and their prices do not include the costs of social dislocation or ecological rehabilitation. It is obvious that inefficient state governments depend heavily on the exploitation of the "natural capital" to make good the losses incurred by other types of enterprises and also cover shortfalls in revenue. Huge profits are being earned from forests and mines. Employment of cheap labour and application of simple and outdated technology keep the cost of forestry and mining low. "One great advantage of these sectors is that high value resources can be produced at low labour cost and with simple technology," says Hiranya Mukherjee, an economist at the National Institute of Public Finance (NIPF) in New Delhi. Royalty and cess from mining form a major source of income for the states. But the Economic Survey shows that the amount of profit in mining is comparatively lower than that in the forestry sector. Minerals like coal and other core industrial raw materials, which attract huge amounts of plan investments, are sold at controlled prices and have a low rate of profits. But several other minerals like limestone have a ready and profitable market. Yet the sheer indifference to the resource base is evident from the fact that, despite the promising gains from these resources, very little is invested in ecological rehabilitation. Largely, northeastern states and other states rich in forest and mineral resources like Madhya Pradesh, Orissa, Karnataka, Maharashtra, Himachal Pradesh and Jammu and Kashmir are extracting large revenues from these resources. The share of forestry and logging in the NSDP is very high in some states. It is more than 10 per cent in Arunachal Pradesh, for instance. "The only way out of this is to diversify the economy," says Sudipto Mundle of the NIPF.